More penguin tabletop games! 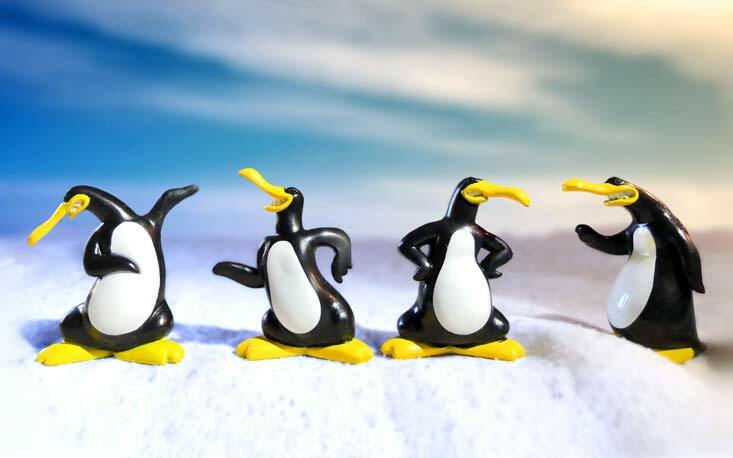 This bunch of cheeky penguins are the player tokens from a game called Pingwin Deluxe. If that name doesn't ring a bell, perhaps you know the game by its original release title Hey, That's My Fish!. In the game you have to catch as many fish as you can by controlling your penguins. Each turn, you move a penguin on a board built from hex-shaped ice tiles. When you move across a tile, you get the fishes on it, whilst the tile becomes a gap other penguins can't cross. The game is simple, yet surprisingly tactical – and has won a several awards for a reason, including the Finnish Family Game of the Year for 2006. Now, it is important to know that there are several different editions of the game out there. The original version had wooden tokens, the re-released Deluxe Edition had the big painted figurines seen here and the current Fantasy Flight Games edition has a whole different set of figures. I absolutely love these Deluxe versions, but I think I need to seek out the other two as well. And, of course, there is a mobile version, too, available for both Android and iOS. Just head to the app-store-of-choice and look up 'Hey, That's My Fish! '.